The Google Assistant needs to be able to associate a query with a command to send to your device. For this to work, you need to declare what kinds of abilities your device supports. These abilities are known as traits. You declare these traits within your device model. 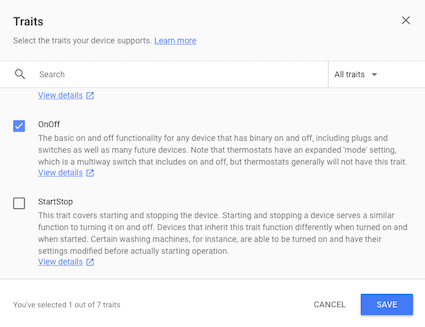 Google has already created a wide variety of common traits found on many devices. These traits are not tied to just one device type, you can use them as you choose. You previously defined a model, now update it by adding a trait. In this case, add an On/Off trait to control an LED attached to your device. Open the project in the Actions Console. Select the Device registration tab from the left navbar. Click a model from the list to edit it. Click the pencil in the Supported traits box to add the trait. Select the OnOff checkbox. Click SAVE. Make sure to save changes to the model. Click SAVE again.